I'd be much obliged to anyone who could translate this for me. 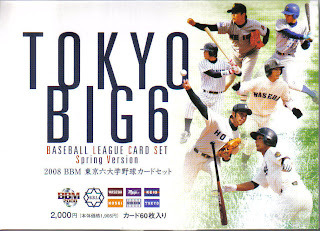 I received my brand new 2008 BBM Tokyo Big 6 Baseball League box set today in the mail from YakyuShop. 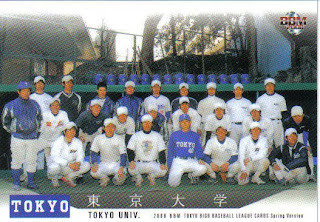 As I said before, the set features 9 player cards and a team card for each of the six universities in the Tokyo Bix 6 collegiate league. 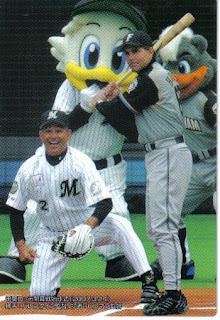 And the inside of the box has a nice picture of what I think is Jingu Stadium, home of the Swallows. Two questions - (1)the box says "Spring Version". Does that mean there will be an "Autumn Version"? (2)Will there be a set for the Kansai Big 6 as well? BBM's website has three new sets listed today - the team sets for the Eagles, the Baystars and the Swallows. Not quite sure when they'll be released, but I'd expect it to be in the next month or so. With the release of these sets, BBM has now released team sets for half the teams - Baystars, Buffaloes, Eagles, Hawks, Swallows and Tigers, leaving the Carp, Dragons, Fighters, Giants, Lions and Marines still to come. OK, I think I'm out of the woods on my computer problems and if not, at least I've got everything backed up to an external drive now just in case. So I'm back. Sorry for a lack of update, but it looks like my main computer decided to stop working. It might be a week or so until I figure out what I can do. This was kind of weird - Gabe Kapler, who retired at the end of the 2006 season and was the manager of the Greenville Drive, the South Atlantic League (low single A)affiliate of the Red Sox last year, made the Brewers' opening day roster this year. I don't think I've ever heard of a player taking a year off to manage before. Hope he doesn't second guess Ned Yost too much. BBM's website today has announced that they will be putting out a set of cards for the Tokyo Big 6 Collegiate Baseball League. It looks like a 60 card box set, with 9 player cards and one team card for each of the six universities - Hosei, Keio, Meiji, Rikkio, Tokyo and Waseda. I believe that this will be the first time that BBM's made a set of cards for amateur baseball. The cards on BBM's website look really nice. I think I'll be picking this set up, even though I don't know who any of these guys are. 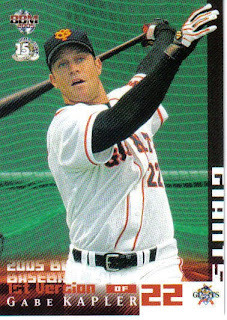 Last Friday, Deanna Rubin had a post in which she mentioned that she had bought a bag of 2008 Calbee Pro Yakyu chips, which gave her her first 2008 baseball card. 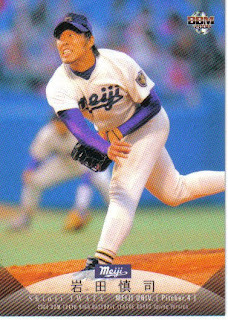 One would think that something like this would be something that might be of interest to a blog that attempts to be a clearing house of information regarding Japanese baseball cards, but sadly, this information has remained unremarked upon until now. 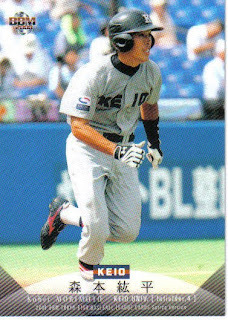 So, anyway, I hear that the 2008 Calbee cards are out! 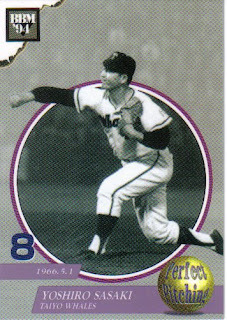 (Not that I really think that anyone reads my blog and not Deanna's...) One useful thing that I did do as a result is track down the link to Calbee's web page for their baseball cards. On the negative side (for me anyway) is that it's in Japanese. On the positive side, it contains checklists going back to 1998. 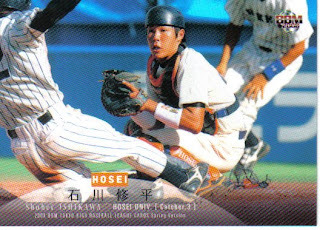 Unfortunately, it doesn't show what the cards look like (although Calbee cards tend to be very similar from year to year). A more recent post of Deanna's reveals that (according to the card shop she went to) BBM's 1st Version set should hit the shelves on April 17. She also mentions that there are cards for MLB being put into Kellogg's cereal boxes. I've seen these (well, last year's version) up on Ebay. These cards are actually produced by Upper Deck. 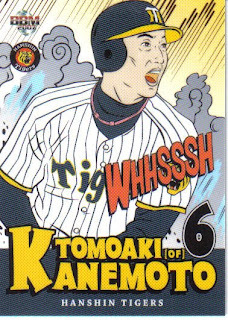 BBM's website has two new sets listed as of today - the new Tigers set and a memorial set to Lotte pitcher Tomohiro Kuroki. The Kuroki set should be out sometime this month. Like the Furuta set, it's a box set with the possibility of memorabilia cards, so it'll run ya. The Tigers set should be out in May. 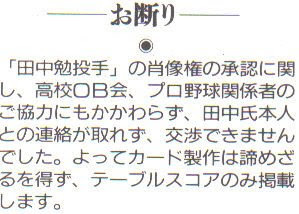 Some further information on Kuroki is over here at Deanna Rubin's site.